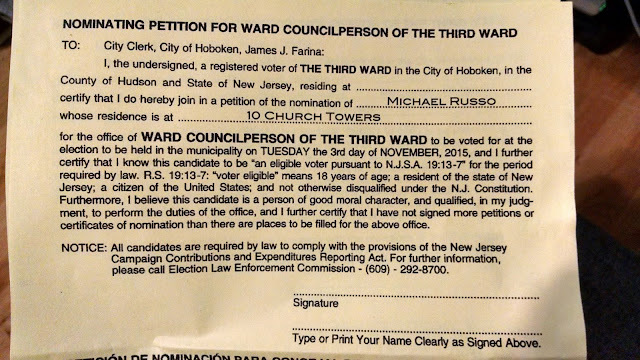 MSV: Michael Russo is in it to win... 5th ward? It's summer in Hoboken meaning the November elections for six of nine City Council seats is not high on the list of resident concerns. For those looking to get on the November election ballot for city council however, it's nothing short of election season. The petition frenzy officially is underway with some candidates sending out juvenile hordes to get required registered voters in their ward to satisfy the August 31st deadline. Councilman Michael Russo, a lifelong resident of Hoboken may need to get a ward map for his campaign workers. According to residents, teeny-boppers are knocking on their doors asking for signatures to get him on the ballot for November. The only problem? The residents live in the fifth ward. For someone with his street smart savvy, a map with the ward lines might come in handy before sending the youngsters on their rounds. Apparently, they have wandered across enemy lines into the fifth ward, the current council territory of incumbent Councilman Peter Cunningham. Cunningham's constituents in the fifth ward report receiving the odd visitations from teens requesting they sign the third ward petition for Councilman Michael Russo. Talking Ed Note: None of this July summer entertainment would even be possible without November elections.